Two months ago, I went to New Orleans to research a profile of David Simon, which comes out in Monday’s issue of New York. I was hanging around Mother-In-Law’s, a local bar, watching a rehearsal for HBO’s new series Treme, when Simon came in and shut things down: the bar didn’t have enough water damage to match the post-Katrina time period. I interviewed Mills that day and also two months later, when I hung out in an editing suite in Tribeca with him, Simon, and a Treme editor as they cut episode seven. In person, Mills was a strikingly laid-back and self-deprecating guy — but as he edited, I could see what a sharp and efficient pro he was at making TV. Over several hours, he skillfully pulled slack bits from jokes, reworked scenes to hide weak performances, and spent a good amount of time trying to maintain the integrity of a performance he admired by a cameo performer. Mills died suddenly this Tuesday, when he had an aneurysm while filming a scene at Cafe du Monde. 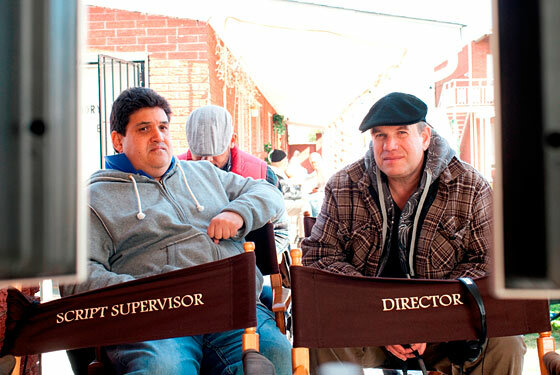 It’s is a tremendous loss for television in general, for the Treme production, and obviously for the people he’d worked with and had close relationships with for many years — he was one of Simon’s closest friends and everyone I met spoke warmly about him. Finally, I’m posting a long excerpt from the interview I did at Mother-In-Law’s, which began as a discussion about Simon and his college years, but ended up veering off into Mills’s broader insights into television, journalism, and online culture. Was Homicide the first show where you and Simon worked together? It was. We wrote an episode that came on the air in ‘94. I was at the “Style” section of the Washington Post Pulse, and I was like, I’ll try not to burn any bridges. I’ll try this for a year and if it doesn’t work, can I come back? And they said sure. Yeah, yeah, it worked out, although now, man, talk about hitting a recession. That was ‘94, before there were writing jobs aplenty on TV. What was the first episode on Homicide? We wrote one of the first nine scripts, but they wound up holding it and launching the second season with it — it’s the one with Robin Williams, where his wife is murdered in front of him. His little son was actually Jake Gyllenhaal at the age of 10, because the director was Stephen Gyllenhaal, Jake’s father. So it made me think, I’ve got to capitalize on this opportunity. As a season premiere, it got reviewed a lot. We won a Writer’s Guild award! So for the first script you ever wrote, one, to get produced, two, to get Robin Williams in it, and three, to get all that attention — yeah, I jumped right in, and Simon stayed in journalism for awhile because he did not covet the career as a TV writer. What did you write about as a college journalist? More so features. Less of the hard news that Simon was drawn to. What was he like in college? The thing I remember about him is, he was very funny. He wrote humor pieces back then. Classic, classic humor columns. One was titled “Eat Flaming Death,” and it was aimed at student ticketers at the University of Maryland, because if you don’t park in the right lot they hit you with tickets. They have a quota so they are the bane of your existence, and he must have accumulated a lot of unpaid parking tickets. It was very profane but fully formed in terms of its voice — a very commanding voice. He would do stuff like typographical humor, writing a whole paragraph with no spaces in between the words, that kind of stuff. I associate that more with web stuff, that wild kind of blog voice. Right, right, right, except at the same time, in terms of any writing standard you would apply to it, it was hot, you know. It was not slack, or careless the way a lot of blog writing is. It really was stuff I think back on now and smile on. I don’t think he gets enough credit for the humor in his shows. Before I watched The Wire, I didn’t realize that it was funny, in a dark way. Same kind of thing with this show. The premise may seem kind of grim, you know, bouncing back after the hurricane and all these ruins and devastation and whatnot — and if it’s not too grim, you might be turned off, because again, it’s going to seem like, “It’s good for you to watch, we’re writing this love letter to the culture.” But then you get into it and realize it’s so much more than that. How did you structure Treme? I’m interested in the genre of the shows that David Simon likes to do, a mixture of reporting, documentary, and fiction, characters based on real people. Right, right. It all comes from the reporting. By the time we got to the end of The Wire, he almost literally said, my tank is empty. He had run out of a literal reporting he had done going back ten years to The Corner, all the stuff he had done about the drug culture and learned about cops going back even earlier. He says, I’m just out of stuff. And when it comes to this, by necessity he hadn’t spent years reporting New Orleans. But it’s the same standard, so there’s a lot of bringing in real people. Did you do reporting for Treme? Not really. We’ve got a full-time researcher and he brings people in that all the writers sit around with and talk to about the political background of the city, stuff like that. We’re kind of reporting as we go and learning stuff in terms of the details. But that’s still the standard. Do you read online responses to the shows you’ve worked on? When Homicide was on, there wasn’t as much of an Internet/TV response. Yeah, I would say that was kind of the dawn of it. Because while he was on Homicide, I was on NYPD Blue, and each of them had devoted online fan bases who would critique every episode and almost before the sun came up the next day, there would be the whole episode synopsis and the critical response as well. I’m interested in how technology has changed people’s relationship with television. I’m interested in that, too, because I was such a fan of Hill Street. Had there been an Internet then I would’ve been one of those nerds! As soon as the show was over, to be writing what you thought about it — I think it’s cool. It’s not necessarily that you take what they say and adjust your game, it’s more so that if you have doubts about what worked, you find out instantly. Previously, you just never knew, because you didn’t hear from people who watched it. The Wire kind of took it to another level because people really made it a lifestyle, almost, to be a fan of that show. Which is a double-edged thing. Having a fanatical fan base can be difficult. Right, right. Well, they haven’t turned yet. We hadn’t seen much of the downside of it. I know David got frustrated by some of the responses from season five. Did you guys live in the dorms? No. I was a commuter, he was as well. We always lived off campus. I was trying to imagine Simon as a student journalist. Did he have crazy long hair? What kind of features did you write? Were they profiles? What was a piece you wrote that you were proud of? You weren’t as happy with it? No. [Laughs.] I’m pretty funny now, but not then. Nothing comes to mind, At a daily paper, we were there every weeknight, putting the paper together until 1, 2, 3 a.m. By the end of a few years I had penned, like, 300 bylines, so you really feel ready. I remember nothing from my journalism classes. You learn all about journalism by putting the paper out, you’re reporting all kinds of stuff, editing the younger writers. That was back when we laid out the paper. I don’t know how old you are — I’m 48. Well, we started at the newspaper on manual typewriters, if you can believe it. I do remember that, from the little newspaper stuff I did. You did the actual physical pasting. Yep, we cut on the back of stuff, the wires — we had actual tickers, you know the AP and the UPI tickers? You’d type on the back of used rolls, you’d rip and use the rubber cement to mark it up with a pencil. That was the best — I mean, that was the best. Newsday just put up a pay wall, I read. Twenty three people signed up. I just told Simon that, ten minutes ago! Yeah, I agree with him on a lot of things, but not this idea that there’s a clear moral impetus for online journalism to say “This is valuable, therefore people should pay for it.” So far, walled gardens have not worked. What do you think? I don’t agree with him. And again, it’s partly because I’ve been blogging for the past three years. I’ve been doing a lot of writing for nothing and expecting nothing, but it’s worth it to be a part of the cultural happening. I think the culture kind of determines itself. It’s definitely that way with music. The record companies are running after the culture, because the record company no longer dictates the means by which people get music, the way they enjoy music. And the news business, the corporations, they can no longer dictate how people get their information. It’s a sad statement on people, but I think it might be true: If they can’t get the Washington Post for free, they’ll read garbage. That hole is not necessarily going to be filled with good information, you know. Boy, I don’t know, because I have kind of fallen out of the habit of reading the daily paper fifteen years ago, when I moved to L.A. For some reason, when I lived in D.C. I read. I was working for The Pulse, but even before that, I’d read the Post everyday. Somehow when I moved to L.A., I never got in the habit of reading the L.A. Times every day and didn’t feel like I was missing anything. Part of that I attributed to just the weirdness of L.A. I’ve lived there for fifteen years and I cannot tell you how many members there are on the Los Angeles City Council! If you watch the TV news in L.A., you’re not going to know, because it’s car chases and all that. So even before the journalism business fell apart, I was no longer a regular consumer of newspapers, let alone a passionate advocate, as Simon has always been. Probably again, this is a difference between coming up on the news side and the features side. Because the degree of cultural commentary you find in blogs or on the Internet, I think, is of a higher order than you have in newspapers. A newspaper TV critic, what do you review? You review the first show of the season. On the Internet, people are writing about every episode and you find someone who’s got taste you really appreciate and follow him. That’s a kind of writing that’s never existed before because the news hole isn’t big enough in the newspaper. So my thing is that the culture is kind of an organism unto itself. Why do you think David feels so strongly about this? I don’t know. He’s just always been a newspaper man to the degree that I certainly never was — an old-school, old-school newspaper man. You seem happy with what you’re doing. Totally — it suits me. It’s a good thing, you know. I think eventually Simon will write novels or do another book and that will kind of suit him. He reads books, he’ll write books. [David Simon, to David Mills]: You’re up! You’re going to be rolling this one for awhile.